With the scene flooded with so many American horror surf bands, it might be easy to miss the Australian group Space Party at first. Consisting of Alex Plegt on guitar, Kevin Lauro on bass and Darren Atkinson on drums, the band officially formed in 2006. I say “officially” since the two guitarists have been playing surf music together since 2003! Although they’ve appeared on our podcast several times, my first exposure to Space Party came from their Hellfire Halloween CD. Said disc is a 2010 promotional giveaway for their Hellfire Halloween show at Canberra and features two takes on the Link Wray surf classic “Jack The Ripper.” The first version is by the band King Hits, which is somewhat low key but awesome. It’s sneaky, just like ol’ Jack. In contrast, Space Party’s is a speedier, louder and rougher take with more of an edge. Focusing more on original compositions, Invasion of the Surfer-Men! starts off strong with “Space Party,” which offers heavy (but classic) surf feel while “Get Surfed” has a lighter feel (but revs up a bit as the song goes along). A creepy film sample about blood-drinking beasts opens “The Creature,” whose heavy, pounding intro (along with the constant screams and evil laughter) makes me think of the Ghastly Ones. That said, Space Party’s own unique sound is still on full display here. “Spanish Song” definitely lives up to its name thanks to its hybrid of Spanish music and Space Party’s heavy reverb. The authoritative opening of “Crime Wave” features lots of drums and guitars which sets up a feel of being on the march. However, this eventually gives way to fast-paced surf guitar goodness. I absolutely love the guitar work in “Gumshoe,” which makes you feel like you’re on the beat tailing a suspect. The reverbtastic “Flight to Mars” conveys the feel of a journey through its super speedy opening and excellent use of percussion. Special guest Glenn Tinsley plays the combo organ on “The Unknown Surfer,” which is put to great use to enhance the sense of mystery. Both the interesting variations in guitar work its mysterious echoes of The Twilight Zone easily make it one of my favorite tracks. Mere words can’t do this justice. “Journey Through the Black Hole” starts off soft ‘n slow, then kicks into high gear and features a lot of great effects work. “Beyond the Surf” ends things perfectly thanks to its mellow and light reverb, which make it feel like the end of a long day at the beach. 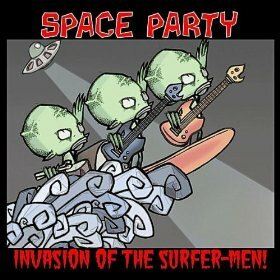 Whether you’re looking for something new in surf music or just want to expand your horror surf horizons, Space Party has you covered on both fronts. Do yourself a favor and snap up Invasion of the Surfer-Men! as soon as you can; you won’t regret it. Here’s hoping we’ll be seeing more releases from these guys in the future! Special thanks to Space Party for use of the image!